With nutritional toppings available at most pizzerias, you do not have to avoid eating pizza. Make better choices, reap the benefits and indulge. Pizza is a fun, fast food that the majority of Americans enjoy. In fact, statistics indicate that in the United States alone there are three billion pizzas sold annually. However, if watching your weight or on a calorie restricted diet, you can still indulge in a slice or two of the delectable pie if you choose certain pizza types and toppings. Start by ordering thin over thick crust, which reduces the calorie count by nearly 30 percent. 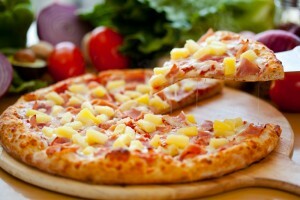 Hawaiian or tropical pizza typically features ham, pineapple and cheese toppings. At seven grams of fat for a three-ounce serving, ham has fewer fat calories compared to bacon, hamburger or sausage while being a good source of protein. Each cup of pineapples provides 100 percent of the daily recommendations for manganese in addition to providing vitamins C and E. When possible, opt for Parmesan cheese over Mozzarella or similar cheeses. Though Parmesan may not offer the same traditional stringy texture adored by pizza lovers, the cheese is lower in fat and high in calcium. Request extra sauce. Providing a mere 79 calories for an entire cup, tomato-based sauces are also a great source of vitamin C and lycopene, which is equated with inhibiting the development of malignant cells. Mushrooms are another smart choice as they provide only 15 calories per cup and 2.2 grams of protein. The popular topping also contains selenium and a wealth of vitamins and minerals that are thought to provide many different health benefits, which include having anti-inflammatory properties. Broccoli is packed with vitamins A, B and C in addition to vitamin K and various minerals. Not only is spinach a good source of calcium, but the vegetable also has vitamin K and more than a dozen flavonoids that inhibit free radicals that discourage cancer development. Garlic and onions are both low in calories, add great flavor and offer many health benefits. In addition to having antimicrobial characteristics, the vegetables help decrease the risk of cardiovascular disorders by decreasing cholesterol levels and acting as anti-inflammatory agents. When ordering downtown pizza Las Vegas, diced chicken is another meat topping to consider. Besides being lean, the meat is also high in protein.